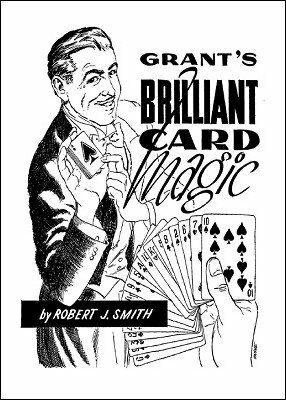 This is a fascinating book on card magic. It shows U. F. Grant at his best. (Robert J. Smith mentioned on the cover was one of U.F. Grant's pseudonyms.) These are some of the most ingenious methods for card tricks you will find. Many are magician foolers. All are very easy to do, but pack a wallop. Most of them require no sleight of any kind! You get 50 tricks in all. Some of these items can be used as show platform tricks such where a glass of ink changes to glass of clear water with a selected card inside using no chemicals. Another effect is that three people just name cards at random. Anyone shuffles a deck and gives it to the performer; he drops the deck into a bushel basket and puts it on his head. He reaches into the basket and rapidly removes the three cards in seconds just named sight unseen! A real magician fooler. digital edition 2017, 20 pages.